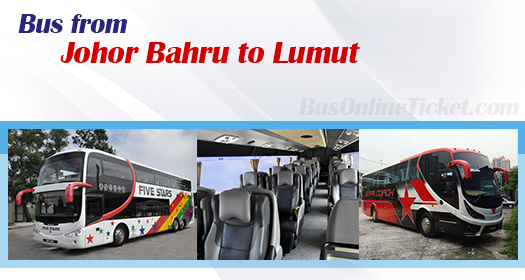 Bus from Johor Bahru to Lumut is one of main bus services in Johor Bahru especially for people, who are working in Singapore and Johor Bahru, with their hometowns from Lumut, Sri Manjong, Sitiawan, Ayer Tawar, Kampong Koh and Teluk Intan. Because there is no train service and flight service from Johor Bahru to these Perak towns, bus becomes the only public transport for them to go back hometown from Johor bahru. The bus fare for bus from Johor Bahru to Lumut, Sri Manjong, Sitiawan, Ayer Tawar, Kampong Koh and teluk Intan is ranging RM65-75, depending on the coach operator. During festive season like Chinese New Year, the bus fare could go up to RM150. Duration for bus from Johor Bahru to Lumut, Sri Manjong, Sitiawan, Ayer Tawar, Kampong Koh and Teluk Intan usually takes about 7 hours. The coach will first stop by Teluk Intan to drop off passengers, before continuing the journey for another 1 hour to Sitiawan and Lumut area. Please note that bus from Johor Bahru to Lumut, Sri Manjong, Sitiawan, Ayer Tawar, Kampong Koh and Teluk Intan is only available in the morning session around 9-10am and night session around 9-10pm. In between, there is no trip during the afternoon because of operation restriction. There are few boarding points in Johor Bahru for bus service to Lumut, Sri Manjong, Sitiawan, Ayer Tawar, Kampong Koh and Teluk Intan. Johor Bahru Larkin bus terminal as the largest bus terminal in Johor is one of the main boarding point. Besides that, Johor Jaya satellite bus terminal, Tun Aminah Satellite Bus Terminal and Gelang Patah satellite bus terminal are the other three boarding points locating in residential area, where they are easily accessed by residents in those areas. With few boarding options available, passengers can choose the boarding point which is most convenient to them.